This book discusses the latest advances in human factors and ergonomics, focusing on methods for improving quality, safety, efficiency, and effectiveness in patient care. By emphasizing the physical, cognitive and organizational aspects of human factors and ergonomics applications, it reports on various perspectives, including those of clinicians, patients, health organizations and insurance providers. The book describes cutting-edge applications, highlighting the best practices of staff interactions with patients, as well as interactions with computers and medical devices. It also presents new findings related to improved organizational outcomes in healthcare settings, and approaches to modeling and analysis specifically targeting those work aspects unique to healthcare. 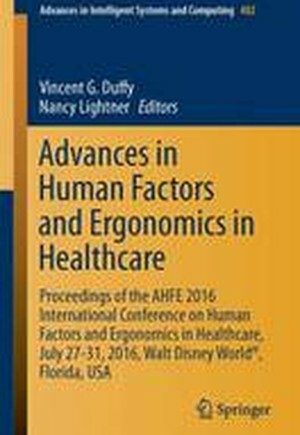 Based on the AHFE 2016 International Conference on Human Factors and Ergonomics in Healthcare, held on July 27-31, 2016, in Walt Disney World (R), Florida, USA, the book is intended as timely reference guide for both researchers involved in the design of healthcare systems and devices and healthcare professionals aiming at effective and safe health service delivery. Moreover, by providing a useful survey of cutting-edge methods for improving organizational outcomes in healthcare settings, the book also represents an inspiring reading for healthcare counselors and international health organizations. Human Factors and Ergonomics in Surgery.- Human Factors and Ergonomics and Healthcare Professionals.- Human Factors and Ergonomics in Healthcare Systems.- Human Factors and Ergonomics in Healthcare Safety.- Medical Device Design.- Healthcare Testing.- Human Factors and Ergonomics in Environmental Design.- Healthcare Communications and Logistics.